Throughout the widely praised Camulod Chronicles, Merlyn Britannicus has been driven by one sacred dream–to see Britain united under one just, powerful king. 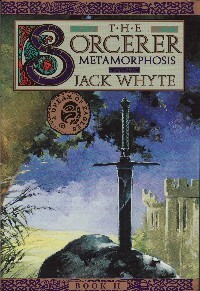 In The Sorcerer: Metamorphosis, it is time for the Sorcerer to fulfill his promise–to present the battle-proven Arthur as the Riothamus, the High King of Britain. When Arthur miraculously withdraws the Sword of Kingship from the stone in which it is set, he proves himself the true and deserving king–sworn to defend the Christian faith against invaders, and to preserve Britain as a powerful, united force. The Sorcerer has fulfilled his promise. The King is crowned, Britain is united–and the face of history and legend is forever changed. There is no more important day in a man’s life than the day he formally takes up a sword for the first time. At that fateful and long-anticipated moment when a youth extends his hand for the first time, witnessed formally by both his elders and his peers, to grip the hilt of the sword that will be his own, his life and his world are changed forever. In the eyes of men, he has become a man, and his boyhood is irrevocably and publicly discarded for all time, much like the shed skin of a serpent. Far more important and traumatic than his first knowledge of a woman, the commitment of taking up the sword is the last and greatest rite of the passage across the gulf between boyhood and manhood. Arthur Pendragon’s transition, and the ritual entailed in it, was a source, for me at least, of joy, wonder, great satisfaction and an immense, deep-glowing pride. It has been extremely difficult to condense into mere words. A score of times I have set out to write of it and ended up with ink-stained fingers, a blotted, much-scratched sheet of papyrus and a quill destroyed because its feathered end is chewed, matted and soggy with my own sucking. Only recently, after many attempts, have I been able to assemble a coherent account of the occasion, and of the events leading up to it, from countless scraps and annotations. Even so, I fear it resembles less a chronology than an anthology of incidents and impressions. Each of those incidents, however, had a direct bearing upon the way in which Arthur came to that threshold of manhood. Did ever a more alienating gulf exist than that which stretches between boy and man? Few things can be more difficult or vexing than the task a grown man will face in the attempt to recall how it felt, or what it meant, to be a boy. The very coin of life in which the two must deal are different. Boys in their prime, between the ages of eight years and twelve, are yet unburdened by sexuality; they are consumed by other, no less insistent forms of curiosity, and are intent upon learning and discovering everything there is to know about being male and potent, powerful and victorious. Men, on the other hand, may still be curious in their prime, but all their curiosity is tainted by their sexuality: for the ruck of men, all that they do is dominated by the urge for gratification of their sexual needs. Because of my unique relationship with Arthur Pendragon throughout his life, I was able to observe him closely as he made the transition from one state to the other, but analyse it as I will, I can recall no catalytic moment that marked the difference between boyhood and manhood in the youth whom I had come to regard as my own son. The external, public moment is a matter of history, but I cannot tell, to this day, when the boy became the man internally. I know only that I was, and I remain, grateful that all I had loved most in the boy remained present and vibrant in the man. His adult sexuality, frequently all-consuming though it appeared, never quite broke free of the restraints imposed by his gentle nature and his fierce, boyhood sense of justice and the fitness of things. In the years that elapsed between the destruction of the enemy Erse fleet at Ravenglass in the great storm and the day when Arthur Pendragon took up his sword, many of the goals I set out for myself were accomplished, and many of my schemes were set in motion; conversely, many planned events did not transpire. I never got the chance to leave Mediobogdum and travel with Arthur as I intended to. Fear for his safety, and a thereat to the safety of our Colony on two fronts, in Cambria and in Vortigern’s lands to the north-east, eventually dictated our return to Camulod that spring. And so our final winter in Mediobogdum came and passed with a swiftness I would not have believed possible. Connor arrived in February, a full month and more sooner than any of us could have thought to look for him. Though an unseasonably early snow had spoiled much of our harvest and threatened a harsh winter, the ensuing season, in fact, had been so mild as to have been no winter at all. In Mediobogdum, the dark, intervening months between the snowfall and the first promise of spring brought almost incessant rain and heavy cloud cover that seldom broke. Only the high peaks of the Fells above our heads showed their normal whiteness. The fierce winter storms that normally ravaged the coastal waters did not occur that year. All of Britain, it seemed, enjoyed the unprecedented warmth and calm. Connor, never one to linger safe at home when there were things he might be doing, had taken full advantage of the mild weather, keeping much of his fleet afloat year-round for the first time in the memory of his people. Normally, his vessels would have been beached all winter long, for the annual cleaning of their hulls, but defying all the gods of sea and storm, Connor had kept them in the water, plying up and down the hundreds of miles of coastline of his father’s new northern holdings and dispatching galleys individually, in rotation, to have their hulls cleaned and stripped whenever he or his captains came upon a suitable expanse of beach. He arrived in Ravenglass without warning, and then appeared at our gates the following day, accompanied by a smiling Derek and riding in his flamboyant personal chariot at the head of a cavalcade. And of course, as it always did, his advent brought joyful chaos for the length of time it took everyone to grow used to his mercurial presence and the excitement caused by the appearance and behaviour of his colourful companions. He came, as usual, burdened with gifts_for me, a clasp-knife, made of bronze and iron, its handle clad in plates of polished ram’s horn mounted in silver. He tossed it to me as soon as I arrived to welcome him, almost running in my haste to greet him before anyone else could. He had not yet climbed down from his chariot and he paused half-way, with his false leg suspended before him, before lobbing his gift to me. For an instant, before he began to move, I saw an unknown, yet strangely familiar face beyond his shoulder. I had only a momentary glimpse of it, however, before I had to concentrate on catching the magnificent knife, and for the next few moments I was caught up in admiring it, depressing the bronze dorsal spine with my thumb to release the iron blade from its clasp, then flicking my wrist, allowing the blade to spring open. Connor came striding over immediately in his swinging, wooden-legged gait and paused in front of me while I examined it, then stepped forward ! with a great grin to throw his arms about me when I looked up to thank him. As I embraced him, I looked again for the face I had seen behind him, and saw the stranger being embraced by Donuil. The family resemblance was unmistakable. Brander and Donuil approached us, their heads close together as Donuil finished saying something to his eldest brother. Brander laughed, and then looked directly into my eyes as he stretched out his hands to me. Both men laughed together, but for a fleeting moment I thought I detected a hint, the most fleeting suggestion, of something unspoken, some minor tension, passing between them. He gazed at me with narrowed eyes, apparently considering my words, then nodded. “It’s a Roman name, but it sits well on the tongue.” I waited, but it was plain he had finished. “It’s true,” Brander admitted. “I have never had a wife till now. Never had time to see to it. But now the wars have slacked a bit. The Sons of Condran and the others from Eire have not dared to show their faces in our north these past three years, and will not do so again, I judge. So I have had time to spend ashore, and there I met_” He broke off, turning to look about him, and his brother cut in. “No, she’s a Pict, from the mainland of your Caledonia,” Connor answered. When he returned, he was accompanied by two women, the younger tall and radiantly beautiful even from afar, and the other older, richly dressed, walking slightly behind them, head downcast as she looked at something she held in her hands. As they drew closer to us, the woman Salina raised her head and quickened her step to walk beside her husband, and I watched the way Brander took her hand and brought her forward, slightly ahead of him, to present her to us. Perhaps because of the youthfulness of her companion, some part of me was surprised that this new wife should be so mature, “old” being a word that no man with blood in his veins would ever have thought of applying to a woman such as her. She was a woman in her prime, beautiful, with high cheekbones and a full, sensuous mouth beneath deep-set eyes of blue so bright that even the whites surrounding them looked blue. She wore a hood of some kind, covering her hair, and she moved with great self-assurance and dignity. I watched her closely and with intense curiosity as she greeted her good-brother Donuil, taking his hands in both of hers and smiling radiantly into his eyes. It was clear she had heard much about Donuil, and equally clear, from the flush that! suffused his cheeks, that Donuil was abashed by the unexpected warmth of her greeting, so that he sounded flustered making excuses for the absence of his wife, who had ridden off into the hills just after dawn to commune with her own gods on the anniversary of her birth. Then the younger woman, Morag, moved forward and was presented to Donuil, and I lost awareness of her aunt. I felt Salina’s eyes fasten on me, but I was too smitten by the beauty of her niece to look back at her. I was amazed at how Morag had changed in the two score paces she had taken since I saw her first. In that first glimpse, she had appeared a glorious young woman of eighteen years; now she was a beautiful child, tall and slim and delightfully formed with high, proud breasts. But breasts and face were startlingly at variance, for while the former denoted a woman grown, the latter shone with the utter innocence of youth. It was a truly lovely face, with wide, grey eyes and a laughing mouth set between silken, dimpled cheeks. I gauged her age now, on seeing her this close, as being less than Arthur’s; newly thirteen, I thought. And then it was my turn to meet Salina, but as I turned to greet her I saw Tress approaching, tucking her hair hurriedly into place and looking flustered. Her first thought on hearing we had guests had been that our guest quarters were all unprepared, and she had rushed off to rectify that. I smiled towards Salina, holding up one hand in a mute plea for her indulgence while I turned very slightly away, extending my other hand to take Tress’s as she arrived. As Tress exchanged greetings with the newcomers, I glanced across at young Morag, with the intention of including her in my welcome, but she was standing, wide-eyed and oblivious, staring at something behind me. Curious, I turned my head and saw Arthur, gazing back at her transfixed. I might have said something to Arthur at that moment, had I the time, although I doubt if anything could have influenced the outcome of what had already happened there. I know I thought of introducing him to young Morag, but even as I raised my arm to sign to him, I saw the thunderstruck expression in his eyes and knew I might as well be miles away. At precisely the same instant, I saw swift movement from the corner of my eye as Connor surged forward to sweep Tressa off her feet in a great hug, and then the civilized pause we had enjoyed gave way to a swirl of movement and the noisy exchange of greetings among friends. Connor had more gifts to present, including a supple and intricately-worked, fleece-lined leather coat of ring-mail for Arthur and an array of weapons, equipment and clothing for the other boys. Tress was dumbfounded by the gift he gave to her, and it was plain to me he could not possibly have pleased her better. It was a carved, wooden chest of ancient, blackened oak, filled to the lid with hundreds of brightly coloured balls of yarn and thread_yellows and reds and blues and greens and blacks and white and greys_all dyed, Connor maintained, in the mountainous northern mainland close by the islands where he and his father’s people now lived. Unable to respond adequately with words, Tress merely smiled at him through tears and then caressed his cheek before removing her treasure, with the willing assistance of several hands, to a private place where she could pore over it in solitude. As we ushered Connor, Brander and their immediate party through the throng to the quarters they would occupy for the duration of their stay, I learned that Brander’s visit was, on the surface at least, simply a temporary and belated visit to his brother Donuil, predicated upon opportunity. Without a war to demand all of his time, Brander had found himself uniquely able to spend time with his new wife, and as a wedding gift to her, he had decided to accompany her southward to visit her sister, who was wife to the Pictish king of the peninsula called Gallowa in Caledonia, a mere two days’ sailing time to the north of Ravenglass. Morag’s mother had been unable to attend her sister’s nuptials, so Morag had attended in her place, and the bridal couple was now escorting the bridesmaid home to Gallowa. Naturally, since chance would bring Brander thus close to Donuil, whom he had not seen in twenty years, he had decided to combine one pleasure with another and to meet, at last, not only Donuil and his wife, but also Merlyn Britannicus, whom he had missed by mere hours years earlier, at the outbreak of the Eirish war, arriving from the northern isles with his father’s fleet just after we had left to sail eastward to return to Camulod. It struck me immediately that the political ramifications of a visit from the admiral of the upstart Island Scots to a Pictish mainland king, when both of them had wives who were sisters, were too obvious to be remarked upon then, during a casual stroll. I resolved to find out more about it later, when the timing would be more appropriate. The quarters assigned to Brander and his people were the best we had at our disposal. As we reached the doors and entered, a group of cleaners rushed to remove themselves, flowing around us on either side to reach the doors, their hurried work completed. The beds, I could see, all had fresh, dry coverings, the concrete floors had all been swept and covered with fresh rushes, and fires had been lit in the braziers on the flagstone squares in each room. I thanked Ascoridorus, the one in charge and the last to leave. He smiled at me and nodded, glancing only briefly at my companions and dipping his head in silent greeting to Connor, the only one he recognized, before he left. Brander had crossed to the brazier and was warming his hands at the new fire, smiling as he looked at his wife. Salina was obviously pleased with the spacious brightness of the room, and Donuil was lounging by the window, leaning against the open shutters. As I asked the question, everyone went still, and my heart jumped. I saw the way Brander looked immediately to Connor, whose eyes then shifted towards Donuil. He, in turn, stiffened, as alarmed as I had been by the sudden change in the mood. Connor and Brander both looked back at me, then. Donuil’s face had drained of all colour. He drew himself up to his full height, sucking in a great, deep breath, then moved away from the window to where he could lean one hip against a high table for support. My eyes were flicking swiftly among all three of them, looking for_what? I could not have answered that question had my life depended on it. Nonetheless, I looked, and carefully. For long moments none among us moved, and I felt Tress’s fingers digging deep into my arm. Finally Donuil spoke, his voice tight. Connor looked at Brander, inviting him to speak, and the eldest brother cleared his throat. Donuil turned away and stood staring out the window, his massive shoulders slumped and his hands dangling by his sides. “She was there to discuss an alliance,” Brander answered, but Donuil cut him short. “Let her tell me,” he said in a dull tone. Salina glanced from him to her husband. “I was there to discuss the terms of treaty with your father,” she began. “And had you made this treaty, when he fell?” Donuil sounded utterly uncaring. I felt my heartbeat begin to pound in my ears as I turned now to gaze at Brander, seeing him suddenly in an altogether different light. “King? King Brander?” Donuil seemed bemused, then he gazed at the floor in front of his feet. “Of course,” he said quietly. “With father dead, that’s as it should be.” He looked up again at Brander and then nodded, once, in acknowledgment, before turning and making for the door. No one sought to hinder him as he made his way outside, but Salina spoke up as soon as he had gone. Brander nodded and followed his younger brother, and when he had gone I heard Connor expel his breath in an explosive rush. When I looked at him he was shaking his head. It was some time before Connor andI were truly alone. When we arrived at his quarters, four of his men were moving his gear from where it had been piled in the road outside, stowing the chests and boxes neatly against the wall that faced the door. While we waited for them to finish and leave us, Connor hung his cloak on a peg by the door, placed his helmet on the table by the window and began undoing his armour. I helped him with the buckles most difficult to reach, then moved two chairs close to the brazier, which had now been alight for long enough to throw out solid heat. A jug of Shelagh’s wine had been placed on the table where Connor’s helmet lay, and I poured us each a small measure. The news of Athol’s death had shaken me and I wanted to drink deep, but I restrained myself, aware that this was one time when I needed to be clear-headed, for I suspected much that I was about to hear would be surprising; I could only hope it would not be unpleasant, too. Connor’s men left as I moved to sit down, holding the two cups, and he held the door open for them, thanking them for their services. When they were gone, he closed the door and clumped across to where I sat, scratching his armpit and evidently deep in thought. He took the mead I offered him, then stretched his legs towards the brazier, and sat staring into the flames for a spell, sipping occasionally at the cup. “No, better for me to listen at this stage, I think. You’re the one with all the information. I have matters of my own to discuss with you, but even those may be affected by what you tell me now. What is so urgent that we have to speak of it alone?” I waited, saying nothing, giving him room to think. “Change… Or changes…” He was thinking aloud, rather than speaking to me, but his voice, and his focus, hardened rapidly, and he launched into a flood of words the like of which I had never heard from him before. “It has been, what, ten years since we first met? Probably more although it seems like less. In that time I’ve seen more changes than I could ever have thought possible. We’ve left Eire behind, abandoning our holdings there, and moved our entire people to the north, successfully. So successfully, in fact, that those who choose to stay there now are calling themselves Islesmen, and with pride…” He lapsed into silence for a while, then grunted in disgust. “Think of what was involved in moving all our folk from Eire, Merlyn! It was a fearsome task, demanding years, a whole lifetime, of effort, and it was my father’s life that went into the doing of it. Oh, we all took part, but his was the vision. He was the one who had to face his people and convince them that the land could no longer support them and their neighbours and that wars and famine were unavoidable unless they, his people, did something they had never done before. Then, on top of that, he had to make them believe they could live better lives elsewhere, beyond the home their fathers had created from the forests, beyond their family fields, beyond Eire itself, in a distant land that none of them had ever seen. I tell you, my friend, I could never have done that, had the task been mine. But Athol Mac Iain did it, and then, having lit the flame of hope within their breasts, he brought them there in safety, despite a raging war against far greater numbers than he himself commanded. “It was.” His voice was absolutely flat, and the way he said the two words, and then paused, raised the small hairs on the nape of my neck. Fortunately, his pause was brief, because when he spoke again I discovered I had been holding my breath. “The Sons of Condran have seen change, as well. Brander’s last voyage brought an end to them as any kind of force. He sailed right into their harbour and caught them unprepared, in high summer. He took a great risk in doing it, hazarding everything upon surprising them, but it succeeded. He planned his campaign carefully_drew off their main fleet in pursuit of part of his, and as soon as they had cleared the horizon, he struck at their home base, which lay upriver from the sea, much like our own old base to the south. Condran himself was killed in the early fighting, along with three of his blood sons. That kicked the resistance out of the remaining defenders. “Well, for one thing, we have become, over the last ten years, a race of fishermen. Now that is a change that alters every aspect of our lives. We’ve always fished, of course, because we lived beside the sea, but now we live among the seas, so now most of our food comes from the water. We eat fish, and shellfish, and seal meat, and sometimes whale meat. We eat birds that taste of fish. Most of our lands are rocky and inhospitable to crops. The bigger islands have good soil, but they’re all forested, and until we clear them we can’t farm them. We grow a little grain, and we have a green crop, kale, that grows well in shallow soil, even through a mild winter. It’s not the most pleasant stuff to eat, but it’s nourishing and wholesome enough. Connor barked a laugh. “You know, I had almost forgotten that! No, he’s no relation. His name’s not even Lot. That’s just a name they use in dealing with strangers. His real name’s unpronounceable, one of those grunting, cough-like sounds no normal human tongue can grapple with. Every time I hear someone say it, it sounds like he’s retching and I pull my cloak around me to avoid being splattered. Salina’s is the same. She chose the Roman name herself, for her dealings with what she calls Outlanders like us. “Anyway, Salina’s sister married Tod of Gallowa some years ago, and there’s some trade between the two kingdoms. Mostly sheep’s wool coming down. I don’t know what the Gallowans send back. When our emissaries arrived in Tod’s kingdom that first time, Salina had just arrived with four of her ships. She took part in the talks, and when it became clear Tod would have problems with some of his chiefs, who knew nothing of us and hence did not trust us, she offered to sail to us and to deal with my father on her good-brother’s behalf. That first visit led to father’s crossing to the mainland later that year to meet with Tod and his chiefs and counsellors. The meetings were successful, but it took two more years before a treaty was forged.” He paused, remembering. I told him then about my decision to return south to Camulod within the month, abandoning our temporary home here in Mediobogdum, and I asked him if he would ferry my main party southward, one last time. He listened quietly, making no attempt to interrupt, but when I had finished he grimaced. “Aye, then they’re Ironhair’s.” I heard the deadness in my own voice. His words had stunned me, but hard on the shock had come an immediate though unwilling recognition of the truth of what he had told me. Ironhair had proved already in the past that he was no fool and that, like his predecessor, Lot of Cornwall, he knew the value of money shrewdly placed and lavishly provided. The fact that he had followed Lot’s example and procured an army of mercenaries with promises of plunder bore that out, but now it was evident that he had carried the procurement of alliances even further and ensured his maritime superiority with these great ships. I looked at Connor more carefully. “I had considered it.” His tone said Yes, I am. I was furious, insulted by his outright dismissal of my request. Harsh, angry words sprang to my lips, demanding to be spat out. Yet I knew I was wrong. Finally, I mastered myself and sat down, aware that Connor had much more to say, and that he, not I, commanded on the sea. He watched me with narrowed eyes, and when I sat down, moving slowly, he continued, speaking clearly and calmly. I sat gazing at him in bafflement, unsettlingly aware that I was missing something here. Finally I grunted in belated realization of another point. If these biremes had seemed threatening enough to Liam Twistback to encourage him to face the perils of a sea voyage in winter in a tiny boat, they also represented a threat to Camulod, which lay within a two-day march of Liam’s farm. “Did Liam say if he had managed to warn Camulod about these vessels?” I asked. He spoke so softly that I barely heard his words, and then I doubted my own hearing. “We’ll row it out of there! If we can be mercenaries on the land, why shouldn’t some of us be afloat, too?” I realized only then that Connor was extemporizing, improvising even as he spoke. “Who will know we are not theirs? They have no enemies afloat, they think_or I believe they think that.” His brow was creased now with the speed and concentration of his thoughts. “A small number of galleys, extra-crewed, their arrival timed to coincide with our attack… But returning galleys…galleys that left the same harbour the day before…no one will think to question their arrival, if they think it’s their return. And when the moment’s right, we strike. We take the ship and board a crew from the galleys, on the water side. It will work, Merlyn, it will work!” He slapped his hands on his knees and stood up, suddenly alight with resolve. “When will you leave?” I half expected him to rush off then and there. “A week or so, no more.” He clumped his way across to the window, his false leg sweeping aside the rushes on the floor with each step, and opened wide the shutters, twisting his neck to lean out and look up at the sky. I was surprised to the see the sun was still shining brightly. I felt as though we had been cloistered here for hours. As we walked towards the kitchens in the refectory block, my head was spinning with all we had discussed, and I had the feeling that much of the ensuing week would be dedicated to the Admiral’s new-developed stratagem for enlarging his fleet. “If They Asked Me, I could Write A Book….” That’s a Song. The Times They Are A-Changin’ . . .